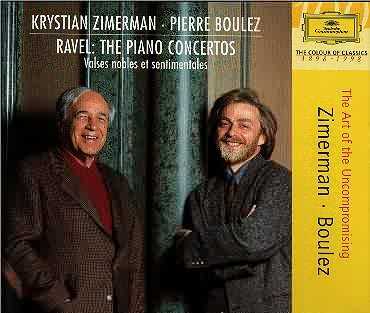 This recording has received rapturous reviews and, indeed, the idea of combining the talents of the virtuoso Zimerman and the one time enfant-terrible composer/conductor, Boulez is intriguing. The result is, as one might expect, electrifying. The sound is first class adding further lustre to a most exciting listening experience. Ravel's G Major Concerto was first performed in 1932. It is a brilliant cocktail of varied influences: jazz, in the outer movements, mixed with Saint-Saëns, Liszt and Mozart. In the outer movements Zimerman brings his usual rhythmic verve and lucidity; thrilling power balanced by a fluid limpid beauty in the quieter sections. Boulez provides a brilliant accompaniment coaxing virtuoso playing and immaculate phrasing rounded by telling little nuances. Notice how well the exquisite harp passage in the first movement is realised (with the aid of clearly captured ppp sound from the DG engineers). I always tense up before the start of any performance of the ravishingly beautiful Mozart-like Adagio expecting much and hoping not to be disappointed. Although Zimerman's phrasing and shading is lovely enough, I felt he was a little detached, lacking that expressive poignancy that Michelangeli brought to this most beautiful of Ravel's creations and Boulez's accompaniment might have been that shade warmer. The Concerto for the Left Hand dates from the same period, 1930-31. It was commissioned by the one-handed pianist Paul Wittgenstein. Again the Jazz elements are prominent but this score is much darker more sardonic than its companion G Major Concerto. It is cast in one continuous movement with the Spanish influences of the G Major Concerto much more pronounced. Its more sinister rhythms have been likened to Nazi jackboots but this is essentially a shifting and brilliantly coloured Kaleidoscopic work, by turn quirky, swaggering, brooding and sentimental recalling many of Ravel's previous compositions. This is a supremely confident and bravura performance, powerful and sensitive by turn. Just listen, for instance, to Zimerman's polished and supremely articulate concluding cadenza and the devastating effect of Boulez's crushingly heavy main climax. I would not hesitate to say that Boulez's reading of the notoriously difficult-to-bring-off-well Valses nobles and sentimentales is the best I have ever heard. The brilliant colours of the more vivacious waltzes are nicely contrasted with the paler pastel shades of the more dreamily romantic dances. Boulez judges the pacing, weighting and lilting rhythms with consummate skill; the Cleveland players responding with playing of great sensitivity and immaculate phrasing. Boulez lingers over a phrase just enough to emphasise romance but never long enough to make sentimentality cloy. His Assez animé is featherweight dainty and delicately feminine; his ebullient Moderé irresistibly inviting. The subtly haunting Epilogue:Lent that mistily recalls preceding themes and both sums up and, in a way, bids a fond farewell to the era of the elegant ballrooms is a triumph.